Join CHRGJ and the International Trauma Studies Program for a rich discussion with Danielle Celermajer, author of The Prevention of Torture: An Ecological Approach, published by Cambridge University Press in 2018. This talk is part of the Conflict, Security, and Development Series. Despite extensive efforts on the part of human rights institutions and advocates to prevent torture and cruel and inhuman treatment and punishment, in much of the world, police and security sector organizations remain impervious to formal legal regulation, and violence remains an endemic component of their operations. As social and political scientists and theorists come to develop more sophisticated ways of understanding the interaction between institutional systems and cultures, broader social and political dynamics, and violent practices, we need to ask how these more complex maps of causality can be translated into practical prevention interventions. 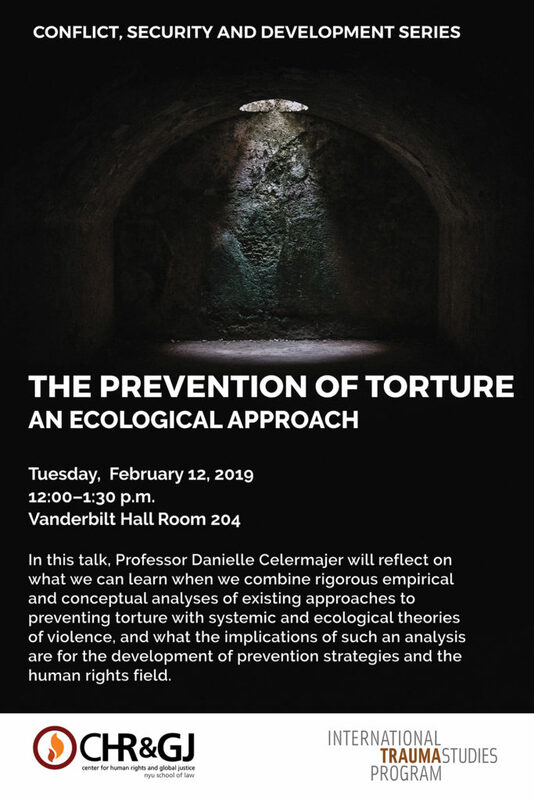 In this talk, Professor Danielle Celermajer will reflect on what we can learn when we combine rigorous empirical and conceptual analyses of existing approaches to preventing torture with systemic and ecological theories of violence, and what the implications of such an analysis are for the development of prevention strategies and the human rights field more generally. Danielle Celermajer is a Professor in the Department of Sociology and Social Policy at the University of Sydney. She recently led an inter-disciplinary team on a three-year European Union funded project researching the causes of torture and seeking to develop strategies to effect institutional reforms that would contribute to the prevention of torture in Sri Lanka and Nepal. Jack Saul is the founding director of the International Trauma Studies Program. As a psychologist and family therapist, he has created numerous programs for populations that have endured war, torture, and political violence, including the Bellevue/NYU Program for Survivors of Torture and Theater Arts Against Political Violence. Deborah Alejandra Popowski is Executive Director of CHRGJ. She is a human rights lawyer and educator with extensive experience in the field of torture accountability and prevention. Nikki Reisch is Legal Director of CHRGJ and a supervising attorney in the Global Justice Clinic, where she has played a pivotal role in the Torture, Rendition, and Detention Project, including as co-counsel in Mohammed al-Asad v. Djbouti. The International Trauma Studies Program is committed to enhancing the natural resilience and coping capacities in individuals, families, and communities that have endured and/or are threatened by traumatic events – domestic and political violence, war and natural disaster. ITSP pursues its mission through providing professional training, conducting innovative research, offering technical assistance to international organizations, and helping build a global learning community in mental health and human rights. Each Tuesday, the Conflict, Security, and Development Series examines new research, discusses creative policy approaches, and highlights recent innovations in responding to the challenges of security and development in conflict and post-conflict situations. The series is co-presented by the Center for Human Rights and Global Justice at NYU Law School, the Center for Global Affairs at NYU’s School for Professional Studies, The Program in International Relations at NYU’s GSAS, the Robert L. Bernstein Institute for Human Rights, and the Office of International Programs at NYU Wagner.